Once in awhile I receive an email from a gentleman in the Netherlands (in perfect English, I might add). Recently he expressed an interest in seeing the Pacific Northwest. "Here in The Netherlands it is so crowded with people everywhere," he wrote. "It makes me sometimes anxious because no one is prepeared for anything in this socialist country." This got me thinking. At the moment in our geography studies, we're learning the European countries and their capitals. 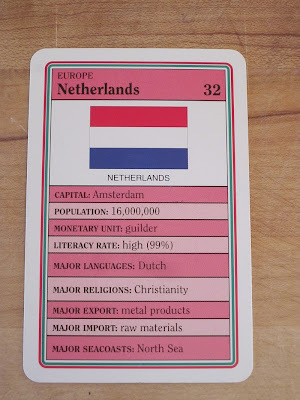 The little flash cards we use show, among other things, the population of each country. I am astounded by how crowded the Netherlands is -- 32nd in size among European countries, yet with 16,000,000 people. And since most of the Idaho population is clustered in cities (Boise, Lewiston, Coeur d'Alene), the vast majority of the state is simply... empty. To be fair, it's hard to make a living here, so it doesn't surprise me that the population is so low. But wow -- 970 people per square mile. That is decidedly cozy. For a more visual comparison the Netherlands is about half the size of Lake Superior. Looking at the map of the US is a good way to start deciding on where a person might want a remote homestead! The Netherland's population density equals that of Massachusetts. And people call that 'living'? Yea right. No wonder MA and all the other urban areas (shown as purple on map) fell for 'Hope and Change'. I'll stick with living in Idaho, any day of the week! I like my space & freedoms! We live in Bangladesh - population density is more than 2500 per square mile. Size approximates Wisconsin. That's really cozy. Italy has an approximate density of 200 inhabitants per squared Km. Spare me a free spot in Idaho. Plenty of room in Idaho. Please come in. Recently I came across an article about the water that comes into Idaho via the Columbia river. Have you heard of "The Columbia River Treaty"? There is an article written by Karen Schumacher on 6/2/2016 posted on Idahoans for Liberty. I would suggest you read this article, it is very scary the powers that are given to the UN should this go through, and the amount of land which is given to them to control.